If the photo above is not of the actual car that my family owned in 1979, it is the same model Chevy Malibu station wagon that my memory has chosen to remember as the actual car that my parents drove to cart my sister and ten-year-old me around that summer and every other summer, before 1979 and after. Our family road trips over about two decades included vacations in Vermont (to see family), weekends on Cape Cod and in Pennsylvania Dutch country and along the Connecticut shore. We were not a wealthy family, so our family vacations were always road trips to a destination that we could reach in one day or less of driving. My father was the only driver, so this was more than fair. The long(ish) car ride was simultaneously unendurable and somehow, maybe sometimes, the only part of the trip that was worth remembering. Given the unspoken assignment to “entertain ourselves,” my sister and I did just that. She is and was two-and-a-half years younger than I am, which was a large enough number to justify my perpetual existential cri de coeur: “Why is she in my life?” Those two (and a half, remember, two and a half) years between us presented us with an unbridgeable chasm that I definitely did not want to bridge or view as anything smaller than a chasm at the time. But on road trips she was the only sidekick life offered me. Her vast collection of stuffed animals, each one of which had a name and always traveled with her, were hired by the two of us to put on theatrical productions (non-union). My parents for some reason tolerated these or at least did not shut them down. What I remember is that we would put up a blanket in the back window as a curtain and move the dolls around in front of the curtain for the entertainment of drivers behind us. Our car was never pulled over. I do not know why not. Were state troopers more forgiving back then? Or was that the sort of vision of domestic hell/bliss—a blanket with two or more stuffed animals putting on a “Punch & Judy” show in the back window—pretty much what everyone expected to see in the rear window of a car like the one at top? When we were not entertaining the world on the Taconic State Parkway, I let my mind wander. I would imagine life in each street sign name we passed under. If I moved here, would this be my favorite restaurant? My workplace? Seen that way, the world beckoned with possibility. Upon arrival at our destination, I was usually discombobulated, as I often am on waking up from a dream or on leaving a movie theater, and I was also somewhat miffed at rejoining real life or whatever real life was for my ten-year-old (not-yet inner child) self. The inside of a Burlington Trailways bus, like the one I sat in. 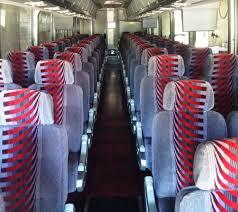 My seat is on the left side of the photo, the right side of the bus, three rows deep. The window seat when possible. Photo from their website. In June 2000, I landed a job and moved partway across the country, from the Hudson Valley to East Central Iowa. Poughkeepsie, New York, to Cedar Rapids, Iowa, by bus. It was a 36-hour-long journey, across all the states required for a person to make that journey: New York, New Jersey, Pennsylvania, Ohio, Indiana, Illinois, Iowa. In anecdotes, I probably make it sound like something I accomplished, when in fact all I did was sit and sometimes stretch my legs. Someone else drove. The population of passengers on the bus was whittled down, layover by layover, because what for me were layovers were for most people their destinations: Cleveland, Gary, Chicago. From Joliet on, a conversation took over the bus, because when it is 9:00 a.m. and there are only a half-dozen people on a bus driving away from rather than to Chicago and crossing the Mississippi River, each of those half-dozen individuals intuits that they have something in common. Someone broke the silence and asked—it was the driver, I remember—What are you all going to be doing in Iowa? We were all going to be leaving the bus in Iowa, some in Davenport, some in the next stop, Iowa City. Only two of us were traveling all the way to Cedar Rapids, and of the two of us, I was the one moving there. I was no longer ten years old, no longer allowing my mind to wander and wonder about my future favorite restaurant, my future workplace, my future. I was in my future and not about to be awakened from a daydream. The moment offered a lot of emotions, and only one of them was excitement. This is an edited column that first appeared in April 2015, December 2015, and then a few months ago. We have been on the road this week. Those wagons were indestructible. I know, my siblings and I did our best to destroy one.